Judge Brian K. Ross was appointed to serve as a judge for the State Court of DeKalb County by Governor Nathan Deal in July of 2015. Shortly thereafter, he was selected to serve as the Traffic Division’s first Presiding Judge. 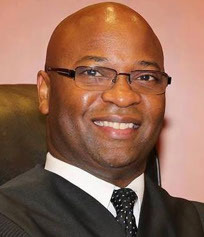 Judge Ross hails from Columbus, Georgia where he graduated from Kendrick High School in 1989. He went on to receive his Bachelor’s degree from Florida A & M University in Tallahassee, Florida in 1993. Upon graduation, Judge Ross served as an officer in the United States Army, where he completed Army Airborne School and was deployed to Saudi Arabia and Kuwait during Operation Vigilant Warrior. In 1996, Judge Ross left the Army to attend the University of Georgia School of Law, where he served as President of the Graduate and Professional Scholars, argued on behalf of the school’s award winning Moot Court team, and was inducted into the Order of Barristers honors organization. Early in his legal career, Judge Ross served as a prosecuting attorney in the Newton County District Attorney’s Office. As an Assistant District Attorney, he prosecuted literally thousands of cases, including armed robbery, drug trafficking, and domestic violence cases. Judge Ross entered the private practice of law in June 2003. From that time until June 2013, he focused his practice in the areas of criminal defense and domestic relations. Judge Ross handled matters in every type of court in Georgia and worked tirelessly on behalf of hundreds of clients. In June 2013, Judge Ross returned to prosecution as the head of the Crimes Against Women section of the Clayton County District Attorney’s Office. In that position, he was responsible for reviewing and prosecuting cases involving crimes against female victims ages 13 and older in multiple divisions of the Clayton County Superior Court. Judge Ross is active in his South DeKalb community and has served on the board of the YMCA Academies of South DeKalb, as the President of the DeKalb Lawyers Association, and as President of the Eagles Ridge Homeowners’ Association. He is married to the Honorable Eleanor L. Ross of the United States District Court, Northern District of Georgia and they are the proud parents of two daughters.